Looking for a way to visualize your travel goals and dream vacations? MyMap is perfect for keeping track of where you have been and where you're yet to go. Just use the guitar pick, that is included, to scratch off the gold foil that covers the places you have visited. You will have a custom world map that you can frame or keep stored away like a scroll. This is the biggest gold Scratch Off World Map available on Amazon. It measures thirty-five inches wide and twenty-five inches tall. When framed, it is easy for people to see where you have been. This makes it a perfect conversation starter for your home or office. Mymap is simple and straightforward without unnecessary elements like country flags or legends. Instead, it has a clean design with geographical details like correct country sizes, longitudinal and latitudinal lines, and time zones. Every U.S. state and Canadian province is individually labelled. Even large countries like Russia and China are separated into their smaller regions. This way, you won't need to buy a separate map just to keep track of your smaller adventures. Made from heavyweight lacquer paper that will not rip easily like low-quality Scratch Off World Maps. The material is durable and will last for years. The paper has a beautiful glossy finish covering the vivid colors. When revealed, each country has a bright color that pops in contrast with the background. Each world map poster is packaged in a black poster tube. Inside you will find a greeting card, felt, pins, buttons, stickers, a small cartoon cutout, and a guitar pick. Whether you are buying this for yourself, as a gift, or as a way to teach your kids geography, MyMap is the best choice. In fact, it is recommended by Amazon for fast shipping, a great price, and a high rating. With a 100% money back guarantee, you have nothing to lose. Place your order today while supplies last.  PERFECT GIFT FOR TRAVELERS : Thick, quality material that won't tear easily like cheaper knockoffs. Made to last for years of journeying. Every scratch off map of the world is packed into a stylishly designed tube, which protects your travel map from damage and solves the problem how to pack your present! This scratch world map makes a wonderful special occasion gift for every traveller: friends, family, girlfriend/boyfriend, anniversary gift! ️ EXTRA SIZE MAP WITH 2 ENLARGE MAPS : Our Travel Map measures thirty-five inches wide and twenty-five inches tall. When framed, it is easy for people to see where you have been. This makes it a perfect conversation starter for your home or office. VERY DETAILED MAP WITH OVER 10.000 CITIES & PLACES! - The scratch off world map is designed with attention to detail and features 11 major countries outlined and divided into regions and states and more than 10.000 places and cities. Plus, in the corners of this deluxe map you will find increased maps of the Caribbean and Europe! 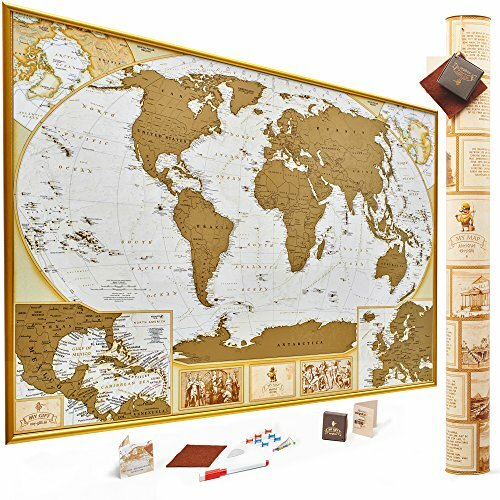 ✈️ A GREAT REMINDER: Our Antique stylish Scratchable map of the world with the Gold coating is the best way to remember the good times and adventures abroad. Just use a coin or our guitar pick to remove the Gold scratch coating and reveal the countries you have been to. It's a great learning tool for kids as well! ⭐ YOU WILL LOVE YOUR SCRATCH OFF MAP OR YOUR MONEY BACK: Hello! We are MyNewLands, nice to meet you on our page:) Welcome to our travel world! You are making very intelligent decision doing business with our company. We know you're a big deal, and we'll only provide you with the finest product and service, or your Money Back with Lifetime Guarantee! Still have questions? Hit us up, we check every message! If you have any questions about this product by MyMap, contact us by completing and submitting the form below. If you are looking for a specif part number, please include it with your message.